NOTE: “Empty” and “Low Ink” alerts are COMPLETELY NORMAL for all HP 74 & HP 75 (including HP 74XL & HP 75XL) ink cartridges which have been refilled! While at first this may be an unusual workflow, it does allow print operations to proceed. In many cases both ‘Ink Out’/’Low Ink” and ‘Nuisance’ alert messages will be displayed, including ‘counterfeit cartridge’ or ‘non-genuine ink cartridge’…these are normal nuisance alerts that can just be ignored by pressing continue/dismiss/Ok. You should be able to continue with print operations until the print quality begins to fade. Once a cartridge is inserted into your printer, the printer begins to track the ink used for that particular cartridge. When a cartridge has used about 80% of its ink, the printer may begin to send the user “your ink level is low” warning messages. After the cartridge is refilled, the printer may continue to send out these warning messages. These warning messages may simply be ignored, and the printer should continue to operate normally. 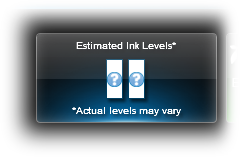 Unfortunately, the low ink alerts cannot be reset or bypassed when using refilled cartridges.